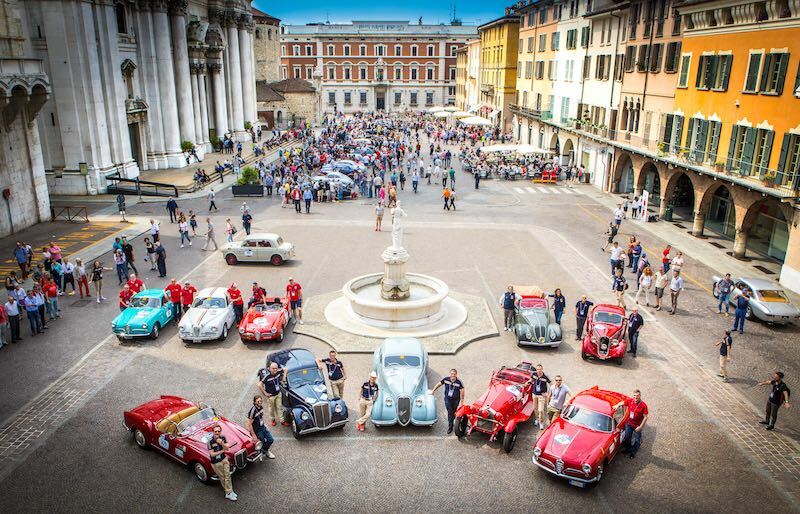 The 90th edition of the Mille Miglia, “the most beautiful traveling museum in the world” as it was aptly called by Enzo Ferrari, recently ended on the finish line of Viale Venezia in Brescia. 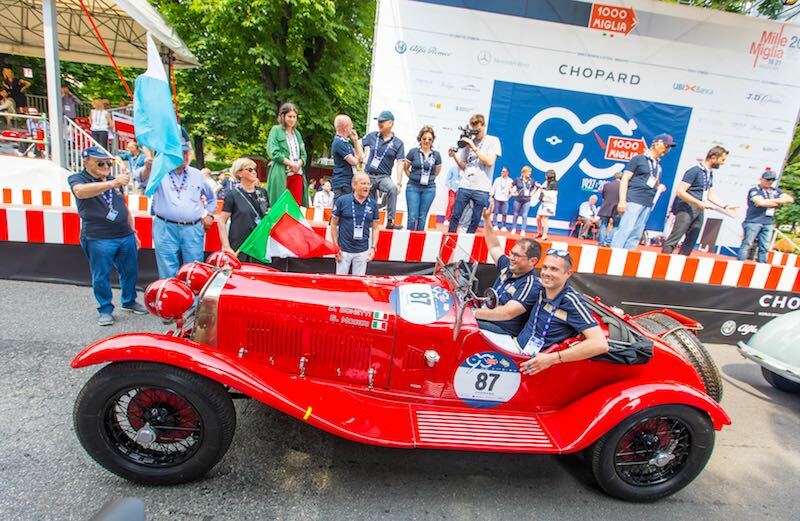 Alfa Romeo again finished strong at the 2017 Mille Miglia, with two models on the podium: the 6C 1750 GS (1931) and the 6C 1500 Gran Sport Zagato (1933). The Milan-based automaker still holds the competition record for the most race victories, with 11, including seven in a row from 1932 to 1938. 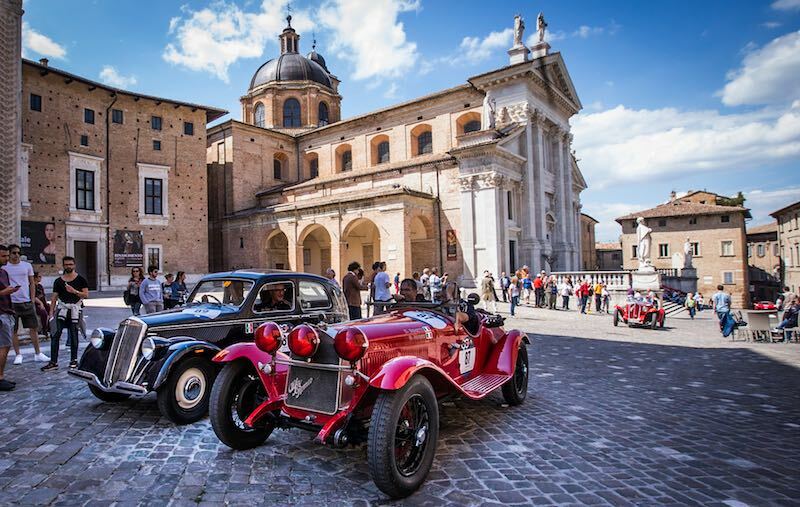 The Alfa Romeo Historic Museum in Arese, Italy sent several of its crown jewels to participate in the 2017 Mille Miglia: the 6C 1750 Gran Sport (1930), the 6C 2300 Mille Miglia (1938) and the 1900 Super Sprint (1955). 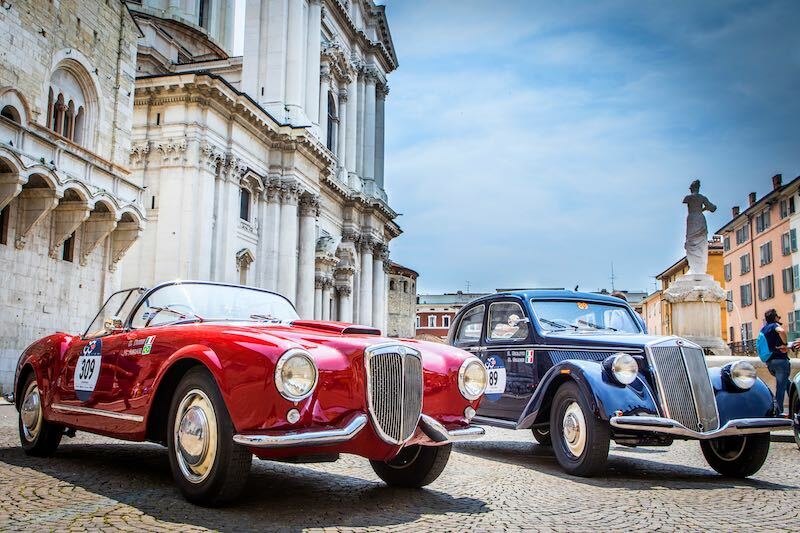 They were joined on the start line by a Lancia Aprilia (1937) and a Lancia Aurelia B24 (1955). Alfa Romeo 6C 1750 Gran Sport (1930) – All eyes were on the 6C 1750 Gran Sport, the legendary model in which Tazio Nuvolari and Giovanni Battista Guidotti won the Brescia-based race in 1930. That was the race of the legendary “overtaking in the dark” episode when Nuvolari achieved the unprecedented feat of averaging 100 km/h over the entire course. The bodywork was created by Milan atelier Zagato. 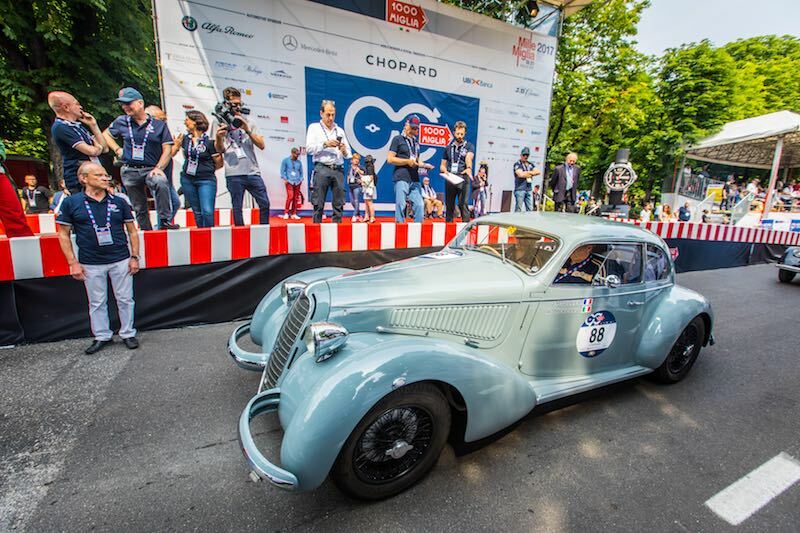 Alfa Romeo 6C 2300 Coupe Mille Miglia (1938) – The 6C 2300 Coupe Mille Miglia with a body made by Touring was also on the start platform in Viale Venezia. 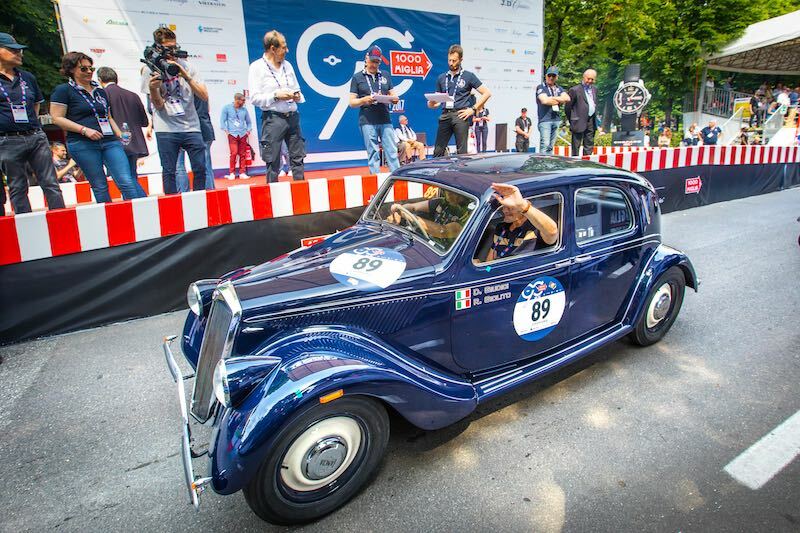 The car is similar to the one that came first in its category in the 1937 and fourth in the general ranking following in the steps of the 6C 2300 Pescara first series. 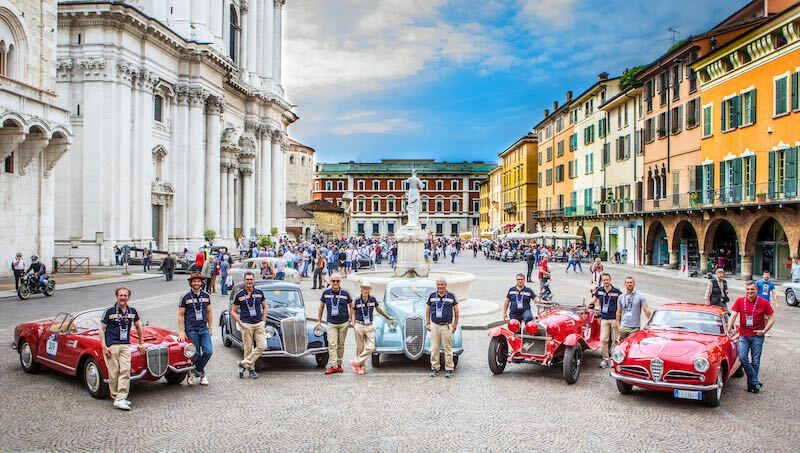 The name “Mille Miglia” pays homage to the performance of 1937: first in its category and fourth in the general ranking. Under the bonnet is a 2309 cc straight-six capable of delivering 95 HP at 4500 rpm and propelling the vehicle at 170 km/h. The car was driven by a crew of excellence: Arturo Merzario and Jean-Pierre Jarier. 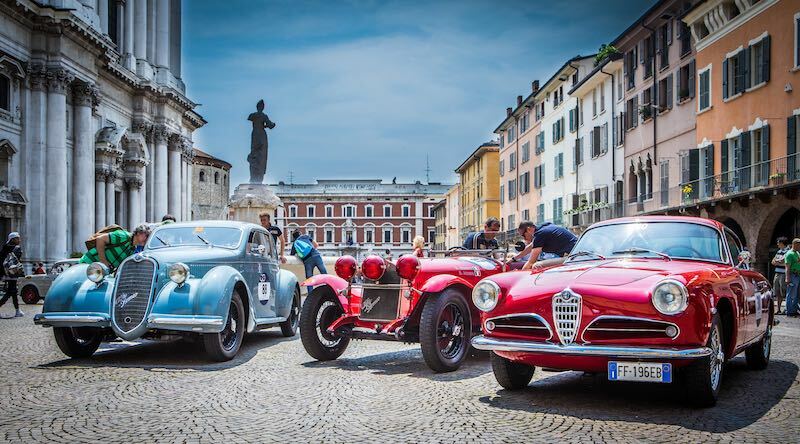 The competitive duo represents the history of Alfa Romeo in motorsports. They took the sport prototypes world championship in 1977 winning all the races on the calendar in their category in an Alfa Romeo 33 SC 12. Alfa Romeo 1900 Super Sprint (1956) – According to the consolidated 1900 family tradition, the Sprint was replaced by the Super Sprint in 1955: it was similar to the previous model but with a new snappier five-speed gearbox. It had the same mechanics as the Berlina T.I. Super, namely 1975 cc displacement, double-barrel inverted carburetor and double rear CV joint. The second version of 1956 which competed in the Mille Miglia delivered 115 HP at 5500 rpm and reached a top speed of 190 km/h. 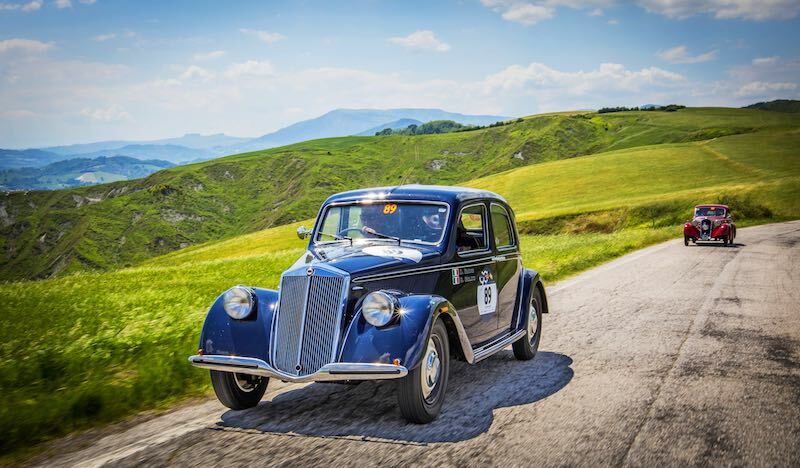 Lancia Aprilia (1937) – The Aprilia, introduced in 1936, was the spiritual legacy of Vincenzo Lancia, who had passed away a few months before the commercial launch of the car. Provided with a unitised body integrated with the chassis without B-pillar, the appearance of the car was innovative. It stood out among the sedans of its day for its particularly aerodynamic line and lightweight securing a top speed of about 130 km/h and good fuel efficiency at the same time. The narrow-V4 with hemispherical combustion chambers contributed to this result. In addition to telescopic independent front suspensions, by now traditional on Lancia, the car fitted independent suspensions also on the rear axle. Lancia Aurelia B24 Spider (1955) – Designed by Pinin Farina, the B24 was presented at the Brussels Motor Show on January 15, 1955. Two-hundred and forty units were made until October 1955. The car had distinctive design details, such as the “wing-shaped” bumpers, doors without handles and panoramic windows and windscreen with American-style retracted pillars. The engine was the legendary V6 designed by Francesco De Virgilio. It had a displacement of 2451 cc and developed 118 HP driving it to a top speed of 180 km/h. The later “Convertible America” version which debuted at the Turin Motor Show in January 1956 appeared much more classic and comfortable: the engine was slightly less powerful and the doors were fitted with handles and winding windows. The production continued until the end of 1958. 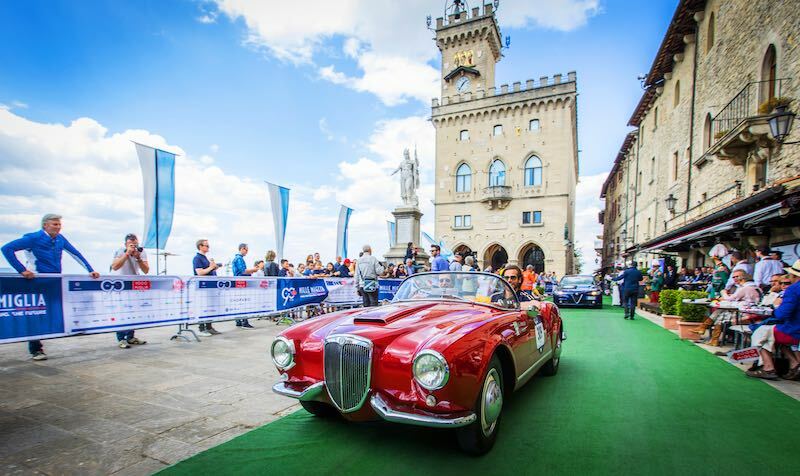 The Aurelia was driven at the 2017 Mille Miglia by Helio Ascari, descendant of the legendary Alberto who triumphed at the Mille Miglia in 1954 behind the wheel of the Lancia D24.